Melvern Lake Natural Resource Manager Jim Franz shows boaters at Melvern Marina samples of zebra mussel shells. Many boaters are still just becoming aware of the nuisance species and how to prevent it from spreading. MELVERN—The result of routine testing followed by a confirmation assessments last week have confirmed the presence of zebra mussels at Melvern Lake. Officials with the Kansas Department of Wildlife, Parks and Tourism and the U.S. Army Corps of Engineers announced the nuisance species presence in both Melvern Lake and Council Grove Reservoir June 29. Thirteen of the state’s reservoirs are now considered infested. Goeckler’s department received results from a positive sample on June 25. 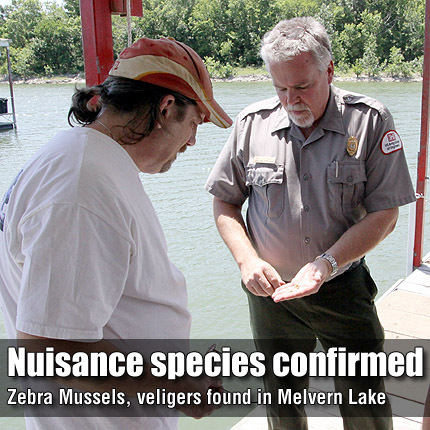 They returned to Melvern Lake June 27 to take a second set of samples to confirm the presence of veligers, zebra mussel larvae. On June 29, they returned to the lake and confimed the presence of developed mussels.